Founded by Portugal in the 16th century, Olinda is one of the best-preserved colonial cities in Brazil. Its historic downtown is a UNESCO World Heritage Site, and roughly one-third of the city is demarcated as a historic area. Brazil calls the city the Capital of Culture, home of an annual Carnival celebration that rivals festivities in Rio de Janeiro. Olinda's age is written in its waterworks, where more than half of the city's treated water is being lost to leakages and erratic pressures range from 5 to 70 meters H2O. Reservoirs and tube wells supply Olinda’s water network, and they were affected by a drought that plagued northeastern Brazil in 2012. The drought was the worst the region had seen in nearly 40 years. Water shortages in the northeast zone of the city necessitated a water distribution rotation scheme that supplied water to seven of the 28 supply areas once out of every four days. Average daily supply periods lasted 11 hours in cycles of 72 hours. At least seven neighborhoods were supplied via direct shunts from pipelines, which cut the areas off from the distribution grid. If all of the city's treated water made it to the tap, there would be a 24/7 supply for the entire population. Compesa awarded a 60-month contract to Enorsul, a technology-driven sanitation solutions company, to design and implement works to optimize operation of the water supply network, identify and reduce water loss, and eliminate the water distribution rotation. Enorsul was retained to address reservoir capacity, pipeline metering, supply pressure, and sectorization. The scope of work covered about 426 kilometers of the network, with 5,598 points of consumption supplying about 230,000 people, or roughly 70 percent of the city. Olinda's water supply system comprised 8,205 pipes, as well as storage tanks, deep tubular wells, booster pumps, flow rate meters, and other components. Enorsul used WaterGEMS to create a hydraulic model of the system and run what-if scenarios to identify potential solutions and analyze the resulting hydraulic behavior. The project team compiled metering records, conducted field surveys, and collected documents, plans, and drawings to gain a better understanding of the system and network topology. The available CAD data was updated, and the physical characteristics of the system were loaded into the water model, including pipe lengths, diameters, materials, roughness coefficients, elevations, and local head loss. 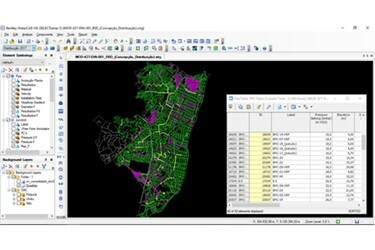 Georeferenced data from the city's geographic information system defined pipe topology, water demand, and other attributes. Combining georeferenced data with field measurements to calibrate the model ensured that the hydraulic model accurately represented the physical water distribution system. The project team used the model to test various proposals for reducing water losses and achieving acceptable network pressures. The hydraulic simulations generated in WaterGEMS compared various scenarios for sectorization and consolidation in the short, medium, and long term. Simulated water distribution schemes in each zone were monitored and controlled, and their effects on reservoir capacities were evaluated. By simulating operational changes as well as interventions at critical points, Enorsul identified the optimal solutions for the network. These simulations also projected network performance over time, based on assumptions about population growth and resulting water demands. The analysis assumed Olinda would experience a 5 percent population increase through 2021, and 22 percent growth by 2037. The team's analysis identified where the supply had to be increased and where it could be decreased to provide 24/7 access to water for the target population. The hydraulic model yielded almost instant results for each scenario, providing the insight needed to plan the long-term rehabilitation of the Olinda water supply network. The team analyzed scenarios through year 2037. Bentley software offered a variety of resources for data management, project design, visualization, and modification at each stage of the process. These capabilities facilitated communication and decision making among the Enorsul project team, Olinda management team, and Compesa operations management. Enorsul conducted a series of meetings with Olinda's operations and maintenance team to review the actions that could be taken to reduce water losses. The hydraulic modeling clearly indicated where improvements could be made to achieve the most benefits for the least investment. The optimal scenario would address network deficiencies, so that the water distribution system could potentially reduce losses from 56 percent to 36 percent by 2021 and from 36 percent to 29 percent by 2037. Based on the simulation results, Enorsul recommended building 48 kilometers of new pipeline and replacing 60 kilometers of obsolete pipeline. Improvements included installing 130 stopcocks, 25 pressure reducing valves, 43 macrometers, and two booster pumps, and constructing five tanks each with a capacity of 2,000 cubic meters. The interventions would further divide the 28 MCZs into 43 MCZs. The improvement program was expected to reduce water leakage enough for Compesa to recover 230 liters of water per second. This would allow the utility to eliminate the water distribution rotation within two years. Hydraulic modeling avoided the expense of conducting field tests. It also demonstrated the value of modeling as a capability for both short- and long-term water distribution network management, including planning and scheduling network renovations. Using Bentley's water modeling software, Enorsul was able to complete the study and issue reports within 10 months instead of the allotted 18 months. This allowed the program to be implemented earlier than anticipated and begin to reduce water losses sooner. With an optimized network, Compesa will be able to treat less water than before and still provide a 24/7 supply, while significantly reducing the costs of the utility's operation. Compesa anticipates that the return on its BRL 130 million investment in this water supply optimization program will be BRL 19.8 million per year. At that rate, the program costs will be repaid within six-and-a-half years. As part of the World Bank-funded Pernambuco Sustainable Water Project, the optimization of Olinda's water distribution system will further the objective of achieving sustainable water supply and sanitation services for Brazil. Modernizing the city's water resource management practices, rehabilitating the water network, and reducing water wastage will help to overcome the problem of water scarcity and achieve water security in the region. Access to water will reduce health risks and healthcare expenses, reduce contingency costs for fire suppression and public safety, and improve quality of life. Reduce water loss in the Olinda water distribution network. Create Metering and Control Zones (MCZs) to eliminate water distribution rotation. Extend capacity to reach a wider area of influence. Hydraulic modeling provided the diagnostics required to make decisions about how to optimize operations, reduce water losses, and meet present and future demand. As a result of this project, hydraulic modeling was adopted as a fundamental means for managing the public water supply. Water network optimization will help overcome water scarcity and achieve water security in the region. Enorsul completed the study and issued reports within 10 months instead of the allotted 18 months using Bentley's water modeling software. The BRL 130 million water supply optimization program will achieve a BRL 19.8 million per year return on investment. The water distribution system optimization program costs will be repaid within six-and-a-half years. 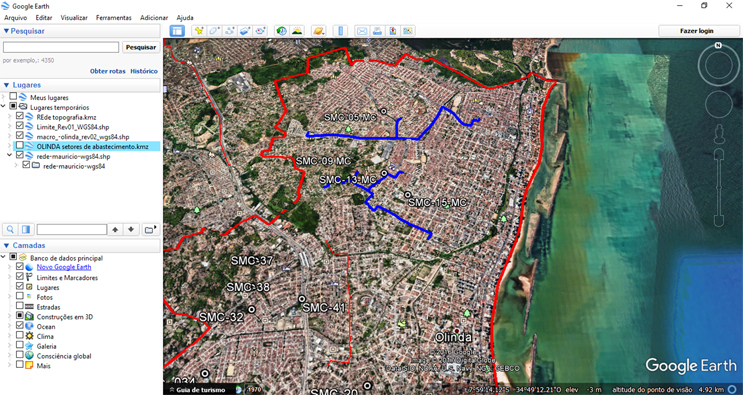 "Using WaterGEMS and WaterCAD, we could evaluate the improvement proposals for the Olinda supply system. These improvements will benefit over 250,000 inhabitants, workers, and visitors in the region. Using these applications formed the basis for a meticulous water loss reduction strategy, which will result in the recovery of treated water on the order of 230 liters per second. Implementation of this capability can help improve human living conditions, and Bentley is a key contributor to this process."